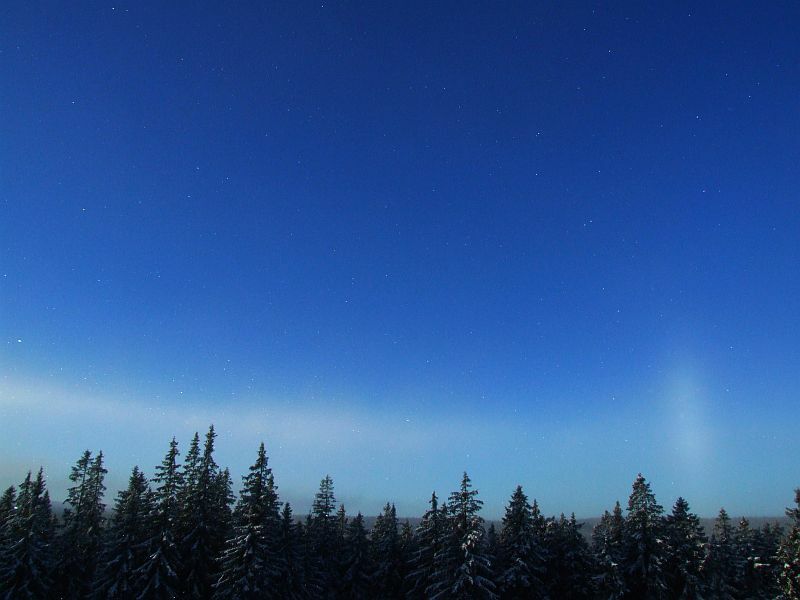 Photos and videos of the windshield halos seen on the night of 26/27 January in Tampere are now available in two galleries ( 1 - 2 ). The display was dominated by plate and Parry oriented halos. Circumzenith and circumhorizon arcs were strong as were the upper and lower suncave Parry arcs. 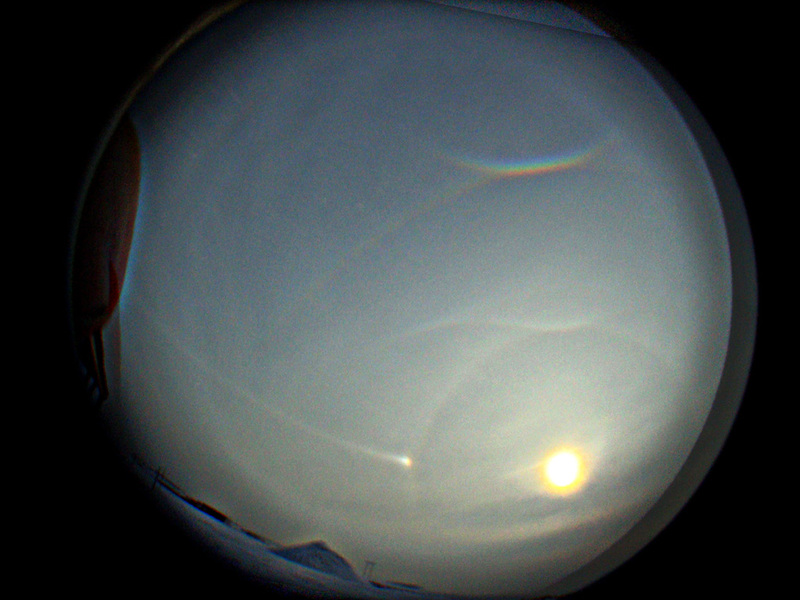 Parhelic circle and 120° parhelia were also well developed. Less conspicuous were the subhelic arc ( 3 ), upper sunvex Parry, 46° Parry and the blue spot. Additionally, two unidentified features were seen. 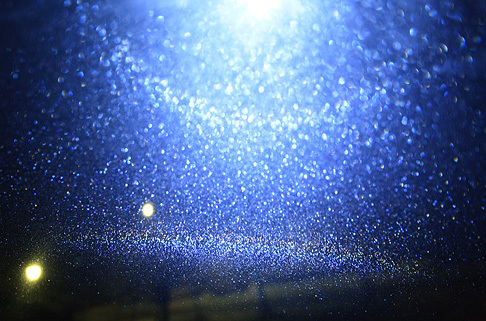 We did not photograph the crystals, but we think the display was formed in frost crystals that have their basal or prism faces parallel to the windscreen. 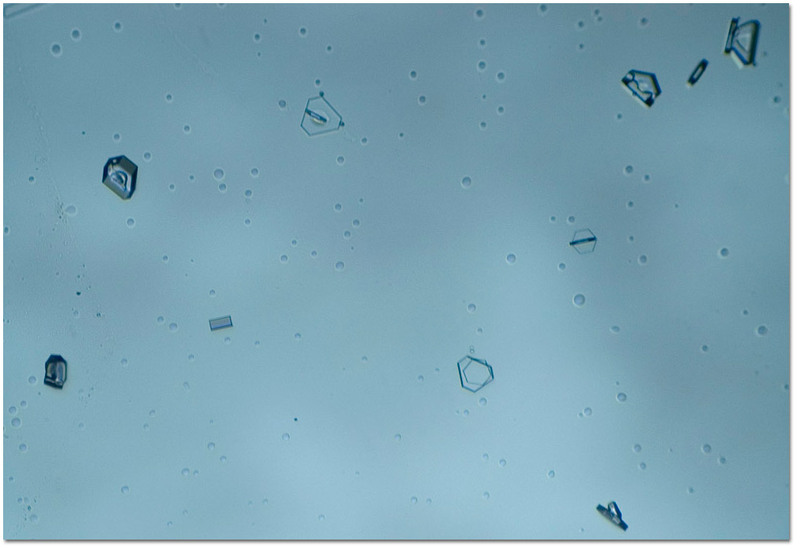 Both populations could be separate crystals, but also 90 degree crossed crystals could be a consideration. Visually the frost seemed rather grainy, which suggests compound crystals. 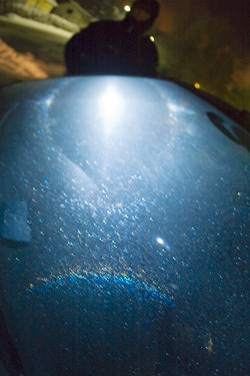 The halos were observed with a LED lamp pointed through the windshield as well as with reflected light (the lamp on the same side of the windshield as the observer). By moving the lamp we were able to observe in real time the transformations in halos that occur as the light source elevation changes (4). Videos show the shift between circumzenith and circumhorizon arc. There are also peculiarities. 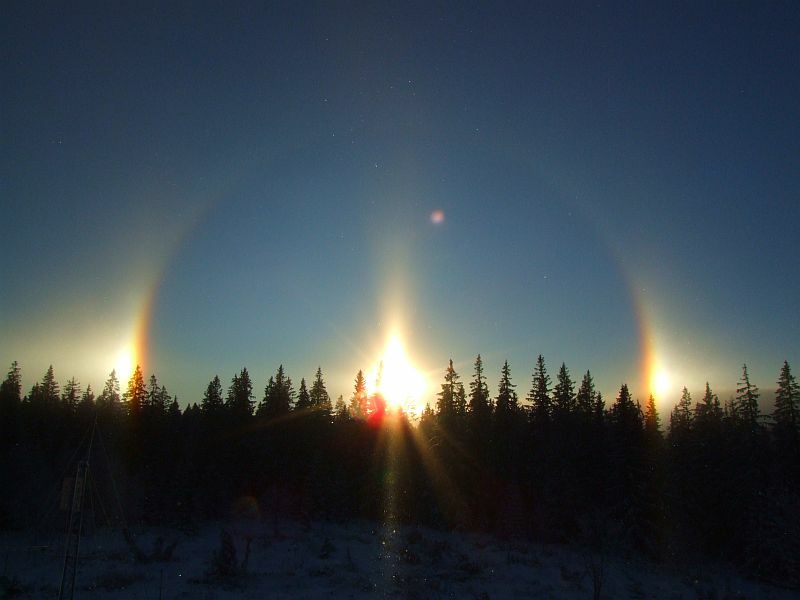 One is that the parhelia does not seem to move much further from 22 halo as the lamp elevation rises. Both two unidentified features were documented. The other one was found from the video: in the video, far below parhelic circle at around 120 azimuth, appears a vertical pillar (5). 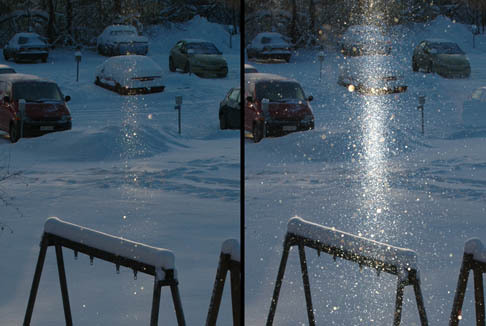 The other effect was a diffuse arc that was seen when we lit up the windscreen from the front of the car and watched it from behind the lamp. This elusive effect was documented in a video (6). 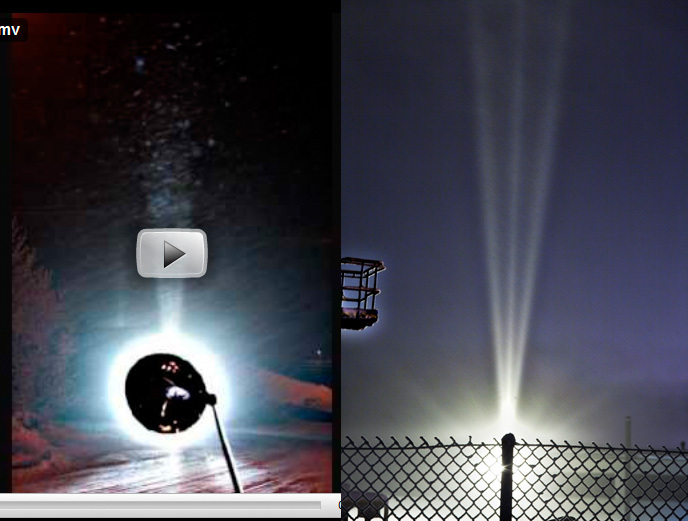 After hours of documenting we ended the night by taking a ride and videoed the halos as they swept the windshield. 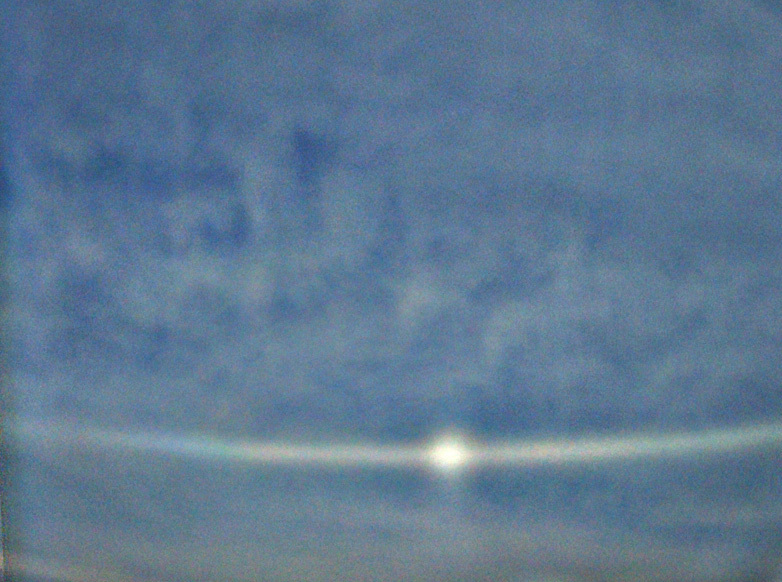 As we neared a streetlamp, first one to sweep the screen upwards was the lower suncave Parry followed by circumhorizon arc. Then, as the lamp was overhead and behind, parhelic circle swept the screen downwards. 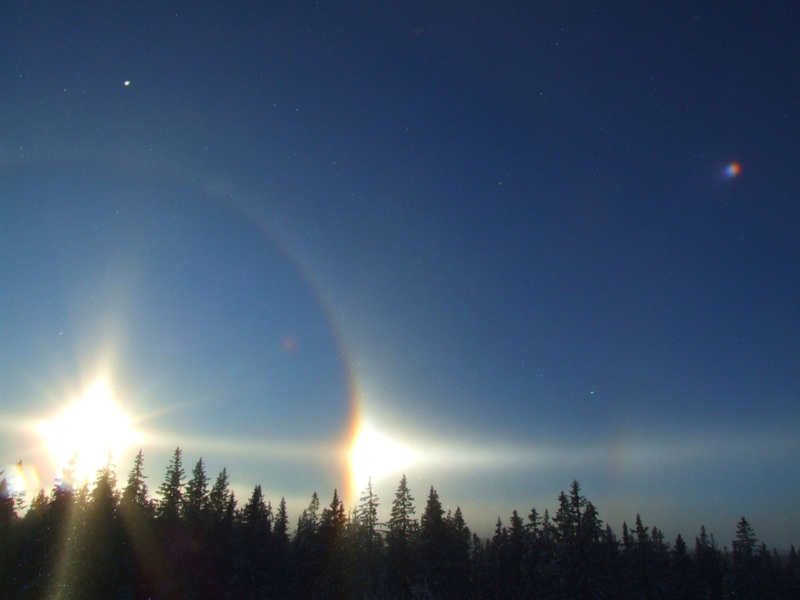 If the lamps were a bit further on the side relative to our driving line, then also 120 parhelion was seen on parhelic circle. It was a great night. In those six hours that we spent worshipping this complex display, we learned all the time more on what we were seeing and created new tricks to take photos. 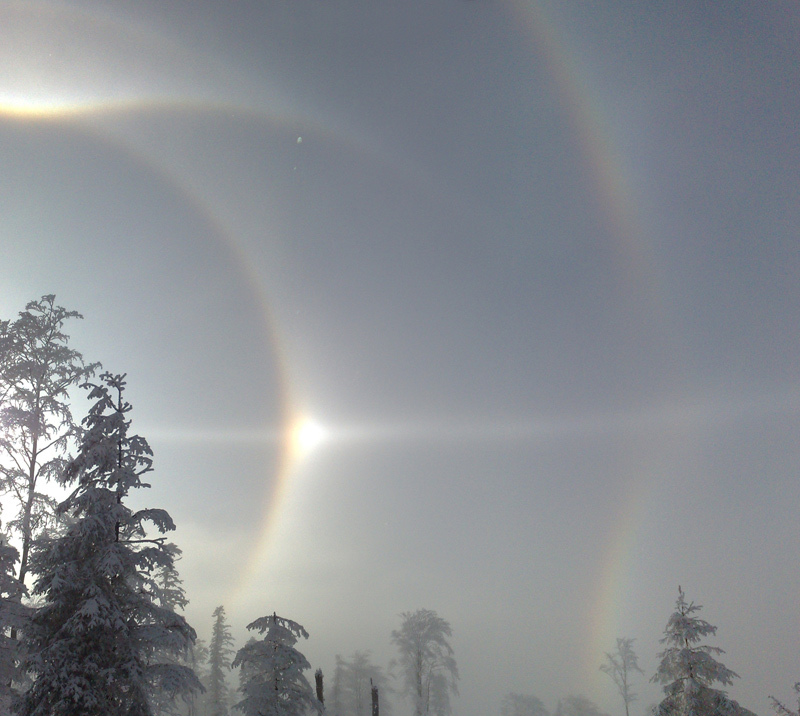 Certainly this winter’s top halo experience for both of us. I would like to present a possible explanation for the Moilanen arc. 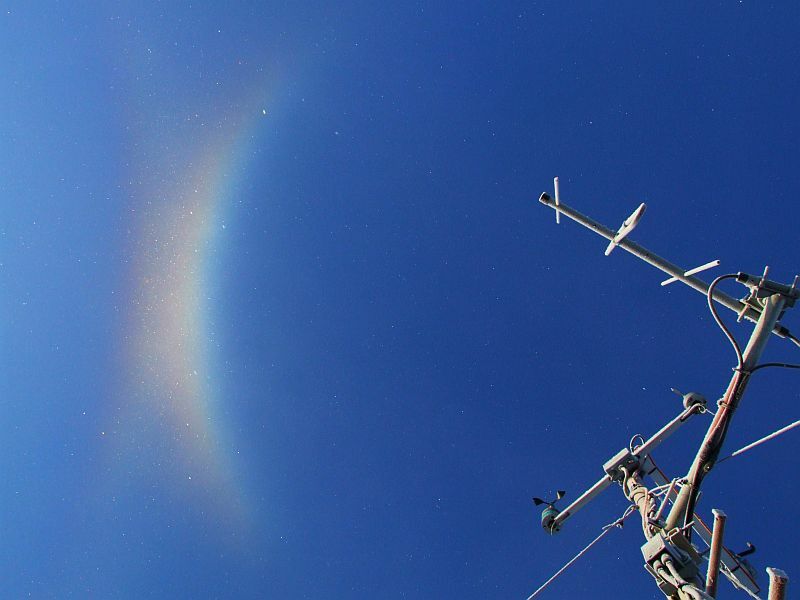 I have read about the existence of this unexplained arc a few weeks ago and tried to figure out possible explanations. After getting the reflected lower sunvex parry and some pyramidal arcs that were also looking like the Moilanen arc, I think I finally have a crystal that makes a very good candidate for the explanation of Moilanen arc. The responsible crystal would be a crystal made of a two hexagonal usual hexagonal crystals stuck together. The simplest configuration would be the one of a plate crystal (called the main plate) with another plate or a column stuck on one of its base (called the stuck crystal). 1 and 2: this configuration is aerodynamically stable when stuck crystal is centered on the inferior base plate. To figure this, one can think of a paratrooper, the parachute being the plate crystal and stuck plate or column being the charge. So naturally the main plate will rotate so the stuck crystal is on the inferior base. Now why would the stuck crystal be centered on the main plate? 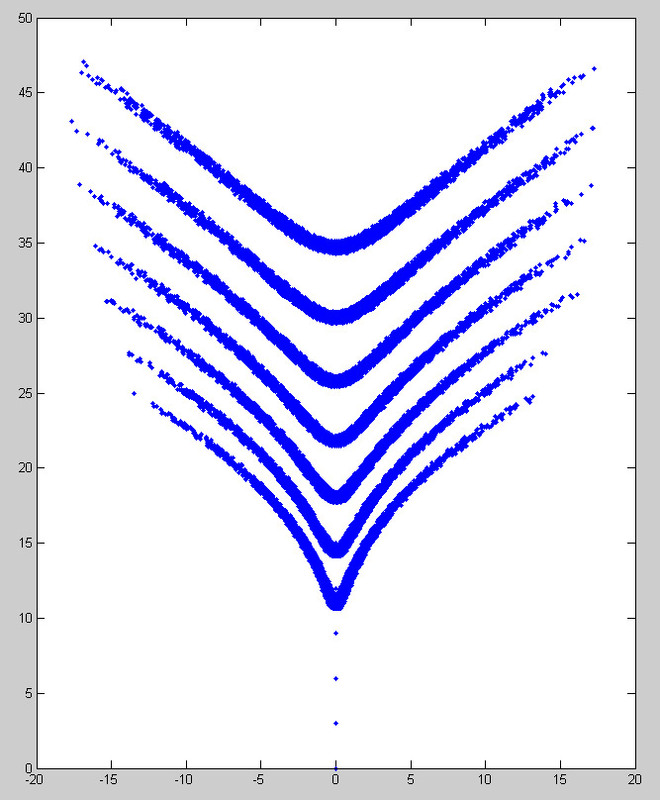 I think that for this stuck crystal configuration to happen, the crystal density must be very high. So in the case of crystal swarms created by snow machine, the crystals would be stuck when they are small, just after their creation. So the growth of the crystal, will happen after. 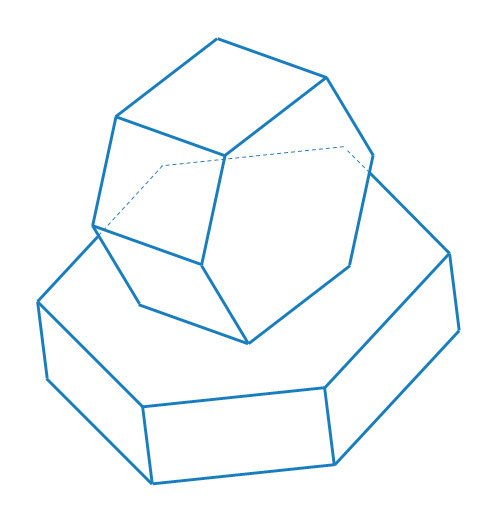 The growth being isotropic, the stuck crystal will naturally be centered on the main crystal. And the aerodynamically stable condition is the main plate being horizontal with stuck crystal on the inferior base. The ray path responsible of the Moilanen arc is the rays entering a vertical side face of the main plate and exiting the upper lateral side face of the stuck crystal. The prism angle in this configuration is 30° but with the entrance face vertical. This configuration of crystal is so still capable of producing all the plate arcs (parhelia, parhelic circle, circumzenithal arc, pillars, etc…) and also the Parry arcs (sunvex through the stuck crystal and suncave through the upper base of the plate and the stuck crystal. So this configuration seems to be well compatible with the halos usually observed with the Moilanen arc. 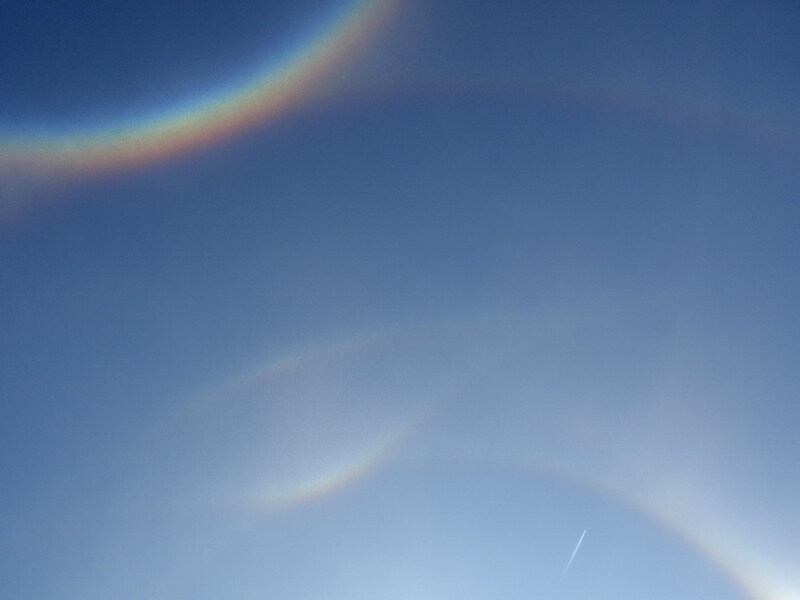 I have been able to check it thoroughly but there does not seem to be any spurious arcs from this configuration. Spurious arcs would be created by rays entering side faces of the main plate and side faces of the stuck crystal. I will try to check it, but for the most simple other rays, it does not seem to exist direct ray path, at least if the stuck crystal is a regular hexagonal crystal. 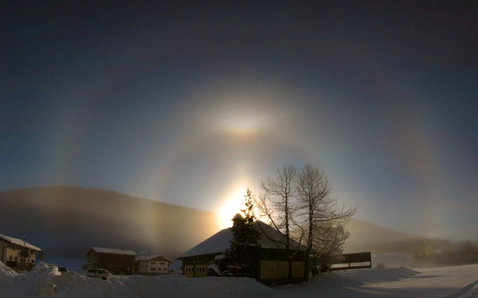 Other rays would just create already known halos. Rays entering by the base of main plate and exiting by the sides of stuck crystal would create parry arcs, and by the base of main plate and exiting by the base of stuck crystal would create circumzenithal and supralateral arcs. The distance between the apex of the Moilanen arc and the sun can be easily calculated using the 30° prism with vertical entrance face description. At low sun elevation, the distance is about 11°. It increases slowly to 13° at 10° solar elevation, 15° at 15° solar elevation, 18° at 20° solar elevation. As the sun elevation increases, the rays path becomes less likely because of the stucking area and also of the increased incidence on the exit face. 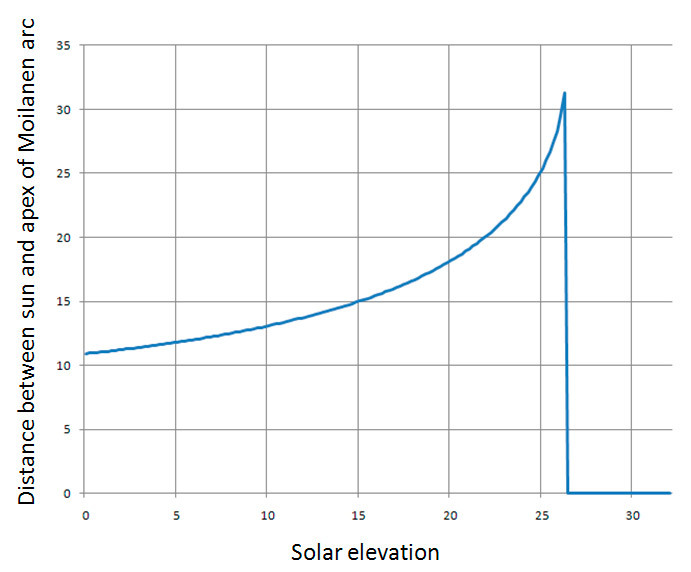 The total internal reflection condition is met when the solar elevation is higher than 26°. 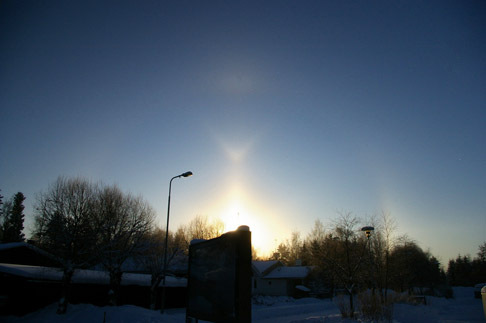 This is in agreement with the fact that Moilanen arc are usually observed at low sun elevations. 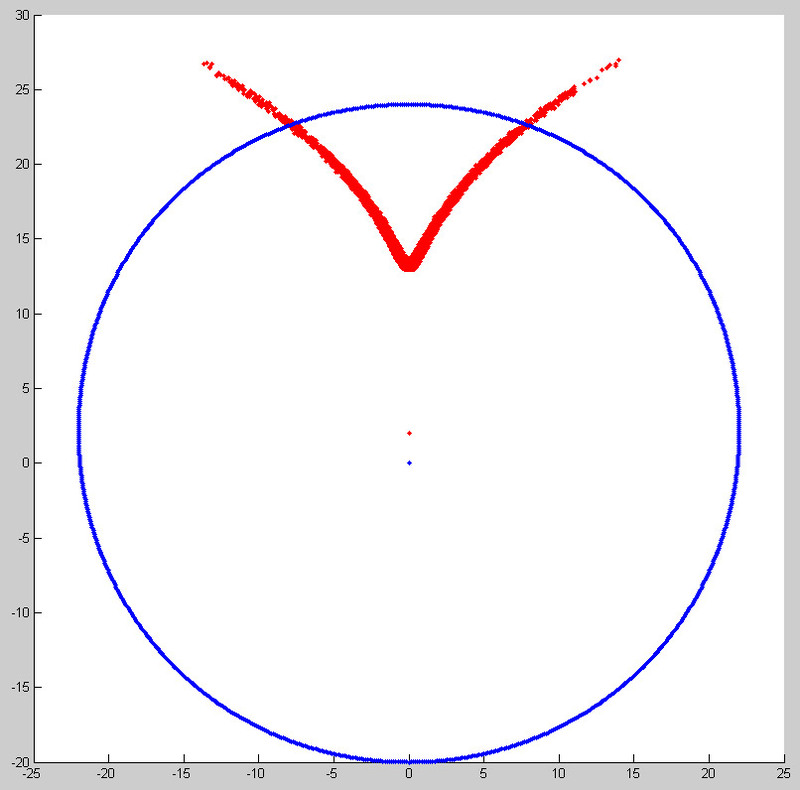 I have made a simple ray tracing program to simulate the Moilanen arc shape. This simulation tool does not take into account the real crystal shape, only the relative orientation of the faces. The shape are represented for 0°, 3°, 6°, 9°, 12°, 15° and 18° solar elevation. 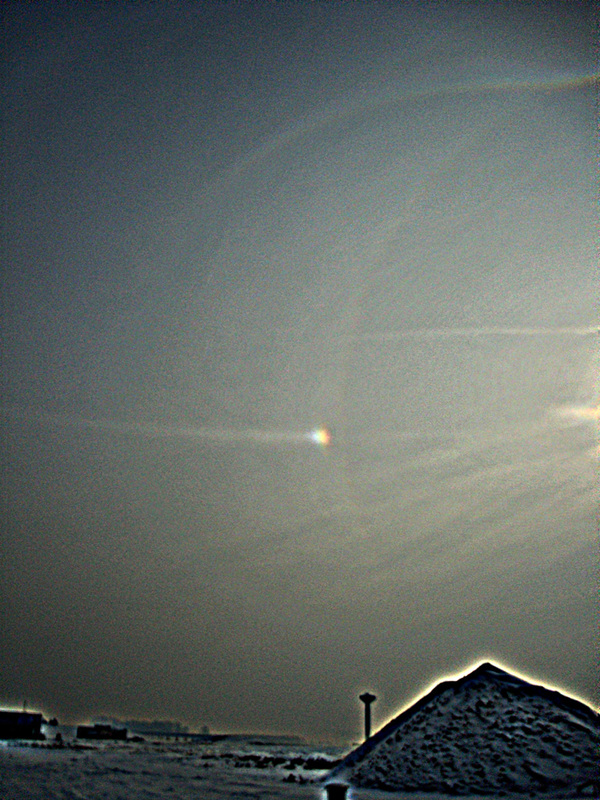 The simulated shape matches very well the photographs of the arc, with a reduced curvature at higher solar elevation. The simulation shows the arc being more extended on the sides as I don’t take into account the real 3D shape of the crystal, but just the relative face orientation. 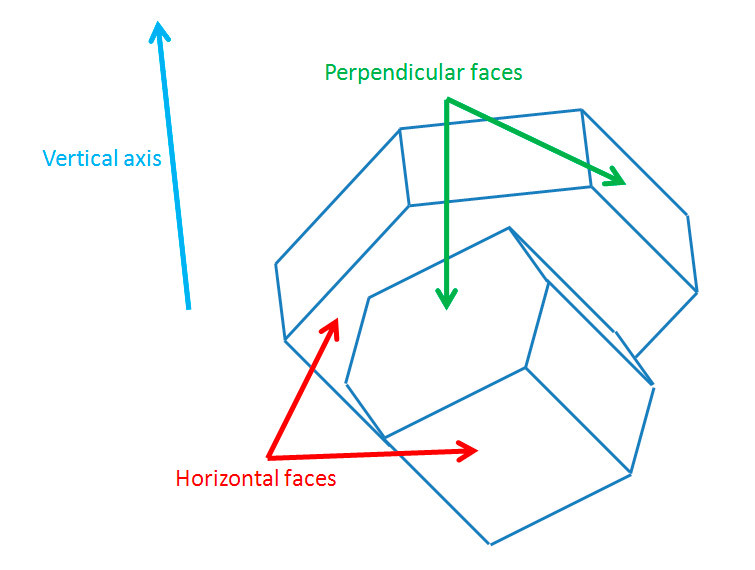 The proposed explanation is based on a 30° prism which entrance face is vertical. In this explanation, the responsible is a horizontal plate on which is stuck a plate or column crystal. I think this type of crystal explains very well most (if not all) of the observed properties of Moilanen arc. More simulations to check that no spurious arcs arc created would help confirm this, as well as some insights of crystals experts on the probability of getting such configuration. 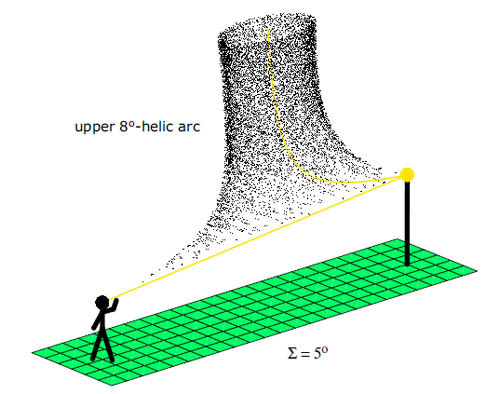 I expanded the "Forked Pillars and Helic Arcs" article. As before, it is on my page ( 1 ). For observers probably the most intriguing addition to the article is the suggestion to watch for a zenith ring. With hindsight the idea of a zenith ring is painfully obvious. Bertram Radelow was the observer of this halo display on 14 December 2009. 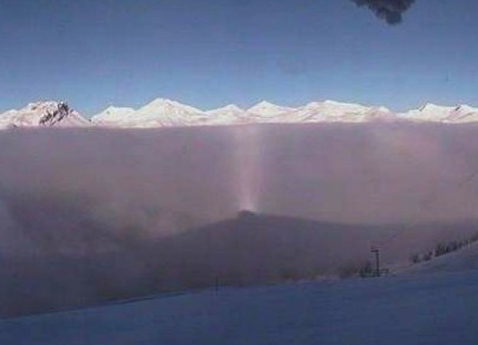 The temperature was -15 degrees that morning in Davos, Switzerland, and the crystals originated from the nearby snowguns. Further images of the display are available on Bertram's site ( 1 - 2 - 3 - 4 ). 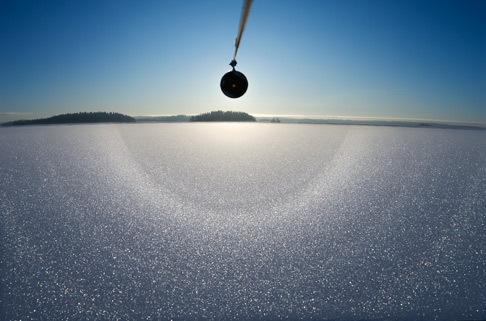 Last saturday I went to lake Pyhäjärvi ice to see diamond dust that was there. It turned out to be water fog, but there was moderate snow surface 22 and 46° halos. 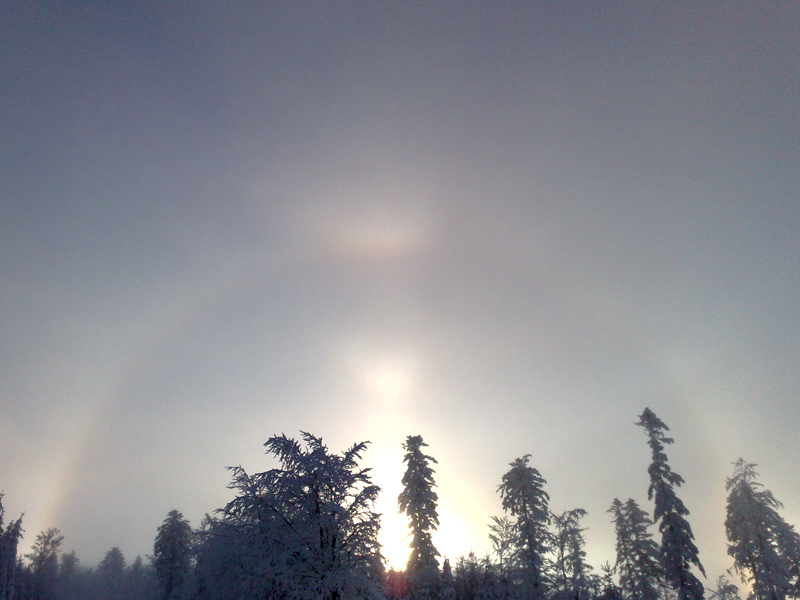 The 22° halo was broad, unlike any other seen this winter, and I thought of seeing a ghost of 24° halo outside it. So it was time to take photos. Stacking revealed the odd radius halos better. 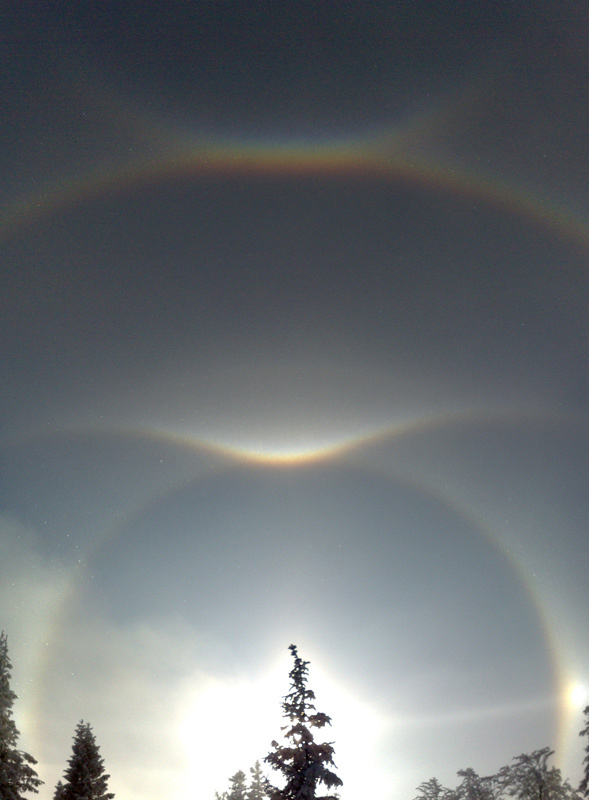 The one above - a stack of 138 photos - is made with lighten mode in Photoshop, and shows 9, 20, 24 and 35° odd radius halos. The 24° one is not well separated from the 22° halo and it shows better in 293 frame stack by average mode using Registax ( 1 ). 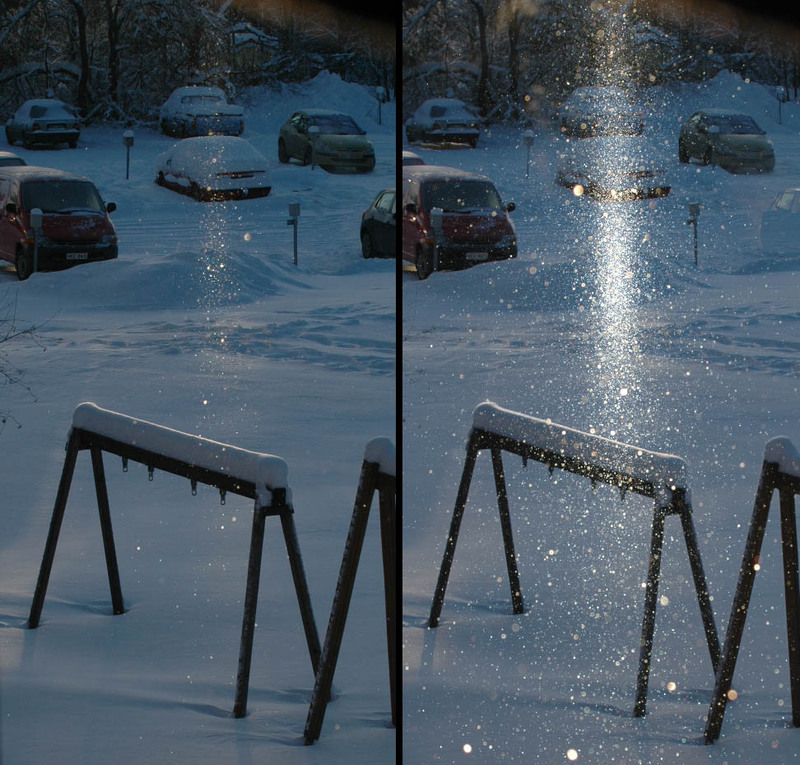 The lighten method (introduced by Jari Piikki for snow surface halos), which chooses the brightest pixel of the stacked photos, provides more realistic looks with the crystal glitter and here the realism is somewhat enhanced due to high number stack. It has the downside is losing colors: colored pixel is replaced if it overlaps with a white one. 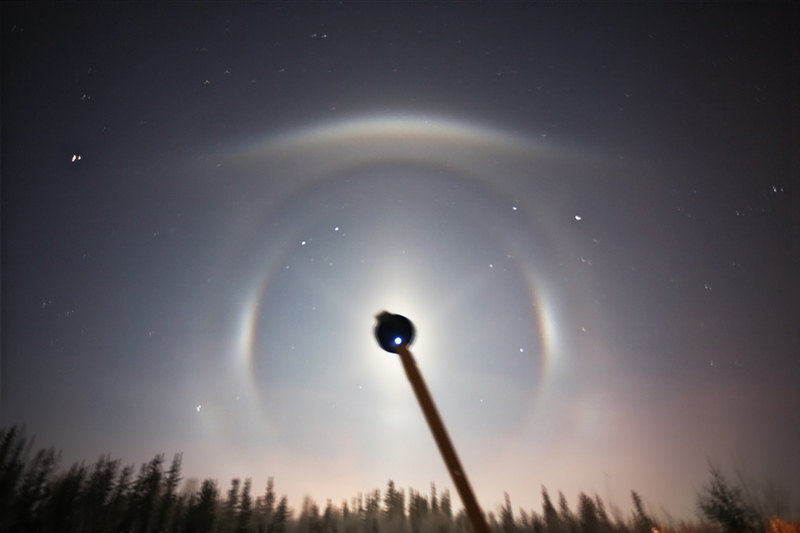 But you can still see plenty colored crystal glitter in the 46° halo in the larger image that opens by clicking the photo. 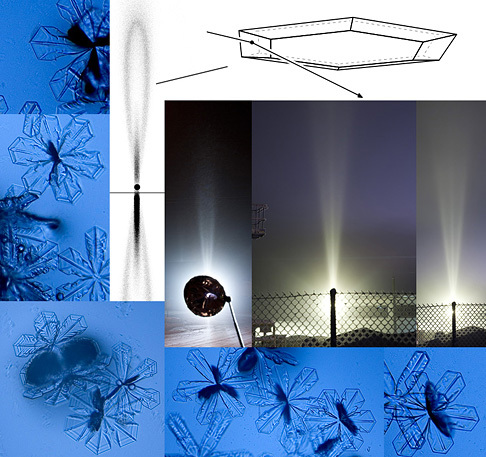 For the lighten method stack photos are taken low down where most of the halo is formed of separate crystals. From standing height the halo becomes more solid, especially near the horizon and then average stacking mode works better. Having seen a couple of snow surface odd radius displays now it seems they can be expected when the snow surface has been fed with water fog. The odd radius halos rarely show up clearly visually, but a broad 22° halo, that is not well defined from its inner edge, seems to be a sure sign. 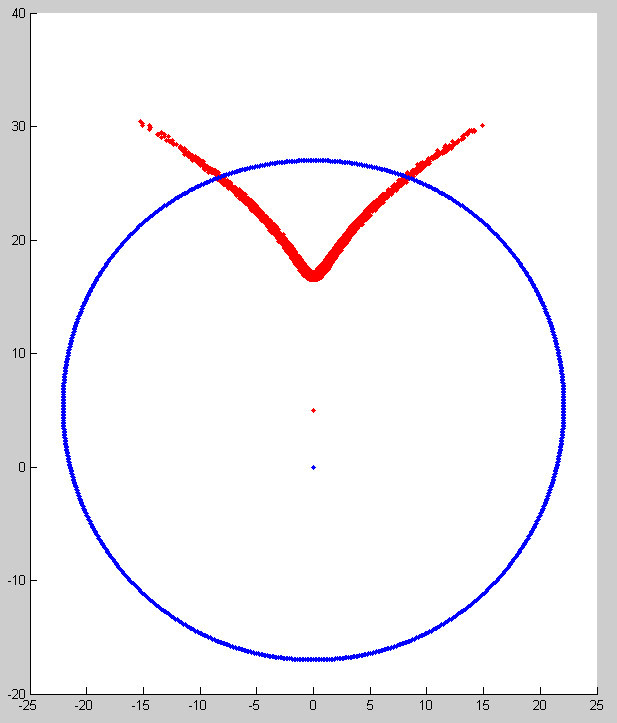 Here is an example of a display where Moilanen arc intensity exceeds other halos. The arc is also sharp. If crystal sampling Moilanen arc displays has begun to feel frustrating, we still should carry the microscope with us: these kinds of displays are certainly worth a look. 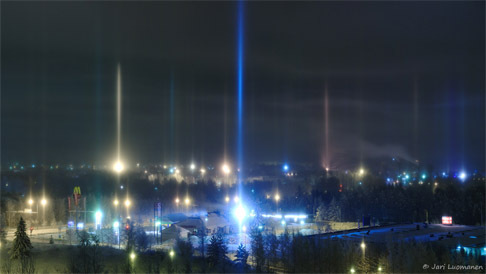 The display was photographed by Harri Mänty on January 9 in Vantaa, Finland. 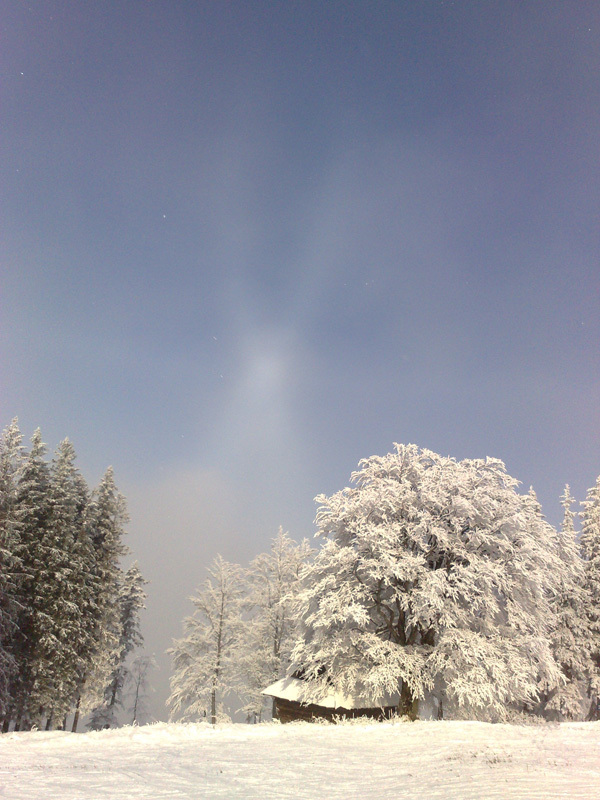 The temperature was about -15 to -16° C. Click the image to see the rest of Mänty's photos.